Create the perfect HDRI environment in minutes with HDR Light Studio. Lighting shots is now fast, precise and easy. Simply click on the model in LightWave3D to position lights on a live HDRI map. Create perfect ‘custom’ HDRI lighting for your shots. Photographic studio light sources bring realism to your images. LightPaint – click on the 3D model to position lights on the HDRI map. Light directly on the camera view without navigating in 3D to position lights. HDRI map containing all lights will render faster than individual 3D lights. How does HDR Light Studio work with LightWave3D? A full version of HDR Light Studio is required to run a Connection. The purchased connection must be the same variation as the main HDR Light Studio (ie. If a permanent license, must purchase permanent connection, or a floating license must purchase a floating connection). 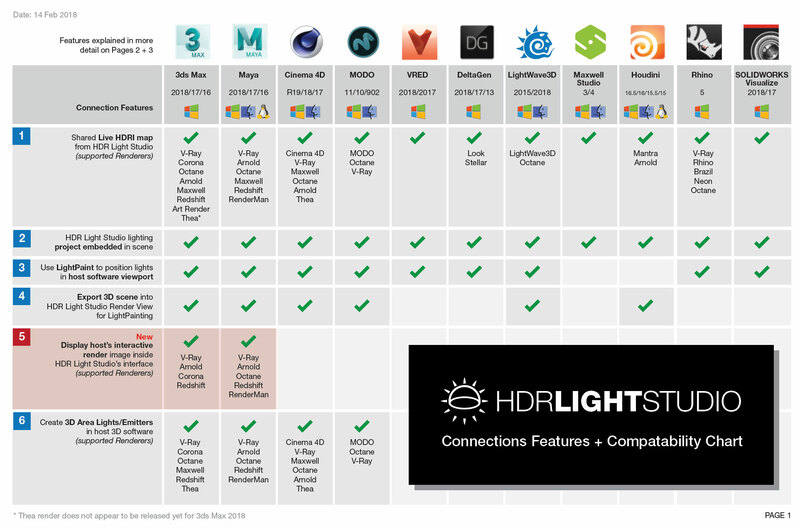 HDR Light Studio's environment map (canvas) is shared with the environment map of the supported renderers in LightWave 3D. During the lighting process a lower resolution map is used for interactive speed. For the final production rendering in LightWave 3D - a full resolution, high dynamic range image is generated and passed through the connection. Purchasing a connection allows artists to click on the model within LightWave 3D viewports to position lights on the map. Supported renderers are LightWave 3D, Octane and Arnold. The HDR Light Studio lighting project is embedded within the LightWave 3D scene file. So the scene lighting can be reloaded and edited in the future. Our latest drop includes: Gamma Control, Tabbed Content Properties, New Ways to Apply Content Presets, Batch Import Images as Presets, and Houdini 17 is now supported. A new feature Gamma control can be used to change the contrast and visual character of a loaded image. This is a great way to adjust the character of lights as seen in reflections. In the Light Properties panel, Content sections have now been tabbed to reduce the need to scroll up and down a long list of properties. Drag and drop the content preset onto any of the new content tabs – Master, Value Blend, Alpha Multiply. This new feature is much faster than the previous process which required scrolling to the required section first. Right click on the Content Preset thumbnail, and choose ‘Apply to Current Light’ to apply the preset to the Master Content of the selected light. This method is perfect for scrolling around the presets and quickly and easily trying out different looks on a specific light. Drag and Drop Content Presets onto lights in the ‘Light List’ to apply them to the Master Content. The advantage of this method is you do not need to select the light in order to apply a different lighting look. Therefore, you can easily replace the appearance of many lights in your lighting design without selecting them first. This is a fast method for totally altering the look of the whole lighting design, and changing the appearance of many lights. Batch Import images as presets. Easily add a batch of images to your User Presets, as Element: Images. Drag and drop the images from your file system onto the Presets panel in HDR Light Studio. This is a perfect way to import a batch of pre-purchased HDRI maps, and add them to your HDR Light Studio preset library to use on future lighting projects – a really useful asset to have readily available within HDR Light Studio. In the batch import process, each preset will inherit the name of the original image file as its description and the batch of images can also be tagged. The images are then batch converted into the .tx format and added as user presets, where they can be dragged and dropped into the image slot of a light. How do I get Carbon Drop 4? If you’re an existing HDR Light Studio subscription or maintenance customer, the release is all yours. Simply log in to your account and download now. If your subscription or maintenance has lapsed you can renew online now. Alternatively, you can take a fully functional 15-day trial or buy here at Toolfarm. Customer licenses will run any build of HDR Light Studio up to and including the version date as shown in the License Management dialogue. All subscription customers can run the latest releases. Customers with permanent licenses get 1 year of updates from the date of purchase, then need to renew their maintenance to update the version dates in their license files. What's new in Carbon Drop 3, released July, 2018. In Carbon Drop 3, Presets have undergone a massive overhaul, expanding to include more lighting ingredient types than ever before. We have made lighting shots faster by developing a ‘Save your own Presets’ feature, which means your favorite lighting settings can be stored, dragged and dropped in an instant, allowing for even more creativity and exploration in your lighting. Rigs are entire lighting designs containing multiple lights. They provide all the benefits of off the shelf static HDRI maps, but without the limitations. Everything is editable in HDR Light Studio, the rig is a starting point and the lighting can be properly crafted to suit your shot. HDR Light Studio ships with a collection of lighting rigs for you to explore. Rigs are a great way of seeing what is possible when using HDR Light Studio. The Drag and drop Content Presets change the visual appearance of an existing light without changing its master and transform properties. The ability to easily switch the appearance of a light allows you to explore different lighting set-ups with speed and simplicity. In HDR Light Studio, there are 6 types of Content, and therefore, 6 types of Content Presets to choose from including BoxGrads, Bulbs, Flats, Gradients, Images, and Skies. Elements can be dragged and dropped onto your Content settings to update them in an instant. For example, if you drag and drop a Preset Value Ramp or Color Ramp onto a Gradient’s properties you can see the results you want much faster rather than building the ramps one peg at a time, every time. A major new feature we have added is the save your own User Presets: Rigs, Lights, Content, and Elements. A time-saving feature that allows your favorite lighting settings to be readily available to drag and drop, and try out in an instant. The Rigs, for example, are not limited to storing entire lighting setups; if you happen to have a small collection of light sources that you use on most projects, you can store them in a rig and drag and drop the rig to add lights instantly to your current project. You can now use Presets to organize the HDRI maps you have purchased into a library inside HDR Light Studio. This means they will always be on hand to try regardless of the 3D software you use HDR Light Studio with. We have also stored User Presets separately from the Lightmap supplied Presets, so you can save User Presets on a ‘per client’ or ‘per project’ basis. Carbon Drop 3 includes an array of additional preset content, including Backdrop Scoops and Coves, Light Tent, LightPaint Trails, Masks, Lit Tracing Paper, and many more. We have received numerous requests to create a connection for Octane Standalone to use alongside HDR Light Studio. Users love the speed, flexibility, and stability of using Octane Standalone and we are pleased to include this new connection in Carbon Drop 3. The connection is very fast and supports both live HDRI map and Area Light creation and control. Octane Render view is hosted within HDR Light Studio, allowing you to paint lights directly on the final render with fast intuitive feedback. The Houdini connection has been updated to support creation and control of area lights, and we have now included support for Redshift. The 3ds Max Connection now supports V-Ray Next. We are really excited and proud of Carbon Drop 3, and we cannot wait to hear your thoughts and see the incredible work that will be created now it is in your hands. Share your creations with us via Facebook, Instagram, Twitter or Behance for your chance to be featured. What's new in Carbon Drop 2? New buttons have been added to the brightness slider. They provide a more photographic approach to adjusting the light brightness. They work by adjusting the brightness relative to its current value. So you can double, halve, increase by 1/3 or decrease by 1/3. This is a really useful addition when an art director wants a light brightening by 1 stop for example. (Double the brightness). Value Blend has been added to the Light Properties panel. It allows blending of the luminosity values from a secondary piece of content with the primary light content. It provides a way to tweak the visual character of a light source. For example, adding a hot spot into an existing softbox, or graduating the light brightness across your light. It can also be used to clamp the brightness within an image, for example clamping the brightness of the sun in an HDRI map. Box Gradient is a really useful new content type in HDR Light Studio. It blends a vertical and horizontal ramp. It’s perfect for softening edges or creating a light with a really interesting character that will enhance your reflections. It is perfect to use on Alpha Multiply or the new Value Blend. When we released HDR Light Studio version 5, we made it easy to use, so the toolbar created simple lights with fewer settings. But many users don’t take advantage of converting them to Uber Lights that provide far more flexibility and creative options. So in this release, all lights are now created as Uber Lights, which include the Alpha Multiply and Value Blend settings. A tool has been added to the toolbar on the Render View (HDR Light Studio) for region zoom. This was available previously only as a keyboard shortcut. Region zoom is great for positioning lights accurately on small details within the shot. Using the buttons on a light in the Light List (on/off, solo, etc) no longer selects the light. It was common for a user to turn off a light and not expect it to be selected, and move a newly hidden light by accident for example. The new behavior avoids this problem. With the addition of the new Value Blend on the Light Properties panel, it was easy to confuse which properties you were editing. We have color coded each light property section making it easier to navigate the properties panel. Big performance increase with production renders containing lights using gradient ramps (which is many light types), especially large lights. Additionally, lighting designs containing many small lights will see significant render speeds too, with smarter use of render threads. The Presets panel now has a LUT drop down to view the presets with correct color space. Presets Panel also provides links to download Preset lights and Installation instructions if presets are missing. Area Lights performance has been significantly improved in HDR Light Studio’s own 3D renderer. Area Lights are now created, adjusted and soloed instantly – even when loading huge 3D scenes. This inbuilt renderer is the perfect pre-vis lighting tool when IPR updates are too slow in the connected 3D renderer. HDR Light Studio is now even easier to use with 3ds Max and Maya. The plug-in now creates the lighting setup for you – simply press Start and begin image based lighting. Bringing the 3D scene into HDR Light Studio is also a click away – press Play and the scene will be automatically imported. HDR Light Studio interface layout is stored on a ‘per connection’ basis. Ensuring a preferred interface layout is loaded when using HDR Light Studio with different 3D software. Please contact sales@toolfarm.com for special bundle pricing if you would like to use HDR Light Studio with additional 3D software - i.e Maya, 3ds Max, MODO, Cinema 4D, Houdini, Maxwell Studio, VRED, Rhino, SOLIDWORKS Visualize, DeltaGen.